THERE’S trouble in paradise. For almost three years, Heena, Fridays 9.30 p.m., on Sony Entertainment Television had been ruling the air waves like a queen bee. Now that seems to be a thing of the past. The TRPs have taken a free fall from a heady 18 to a low of five. Such has been the ensuing panic that there’s been a sudden reshuffle of the pack. Out goes Javed Sayyed, who did a fine job directing the serial for over 150 episodes, and in comes Jeetendra Kumar. Problems are reported to have cropped up when ratings started to fall. The producers felt that the serial was losing steam and needed a fresher and pacier approach. Sayyed is said to have been more in favour of the current laid-back pace that appropriately reflected Muslim culture and grace. The only way out for him was to quit. Now the new director Jeetendra Kumar has his job cut out. Keep the continuity going but make it more racy. Thus there are lots of surprises being added to the story line. With vamp Ruby grabbing centre-stage, Heena’s divorce with Akram seems certain. Will she go back in the arms of former husband Sameer? No one really knows. Both the scriptwriter and the director are working out various combinations to inject an element of pep and surprise to pull it back from the precipice. The film may have been one of the most expensive flops of the year, but the producers of Asoka-The Series every Tuesday at 9 p.m. on Star Plus must fervently be hoping that it clicks with primetime viewers. Ironically, sometimes the making of a movie can be a far more absorbing experience than the actual film itself. And that’s exactly the case with Asoka. The 5-part mini series unfolds elaborate planning, costly set designs and the little sidelights that went into making the movie. 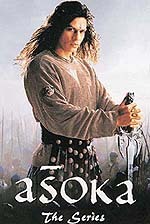 "I simply had to play Asoka," says Shah Rukh Khan." In my interpretation he is a Greek tragedy hero, who arrogantly breaks social and moral codes. But when he realises his wrongdoing he changes the course of his life — and with that he also changes the course of the world." Playing the princess-in-exile, Kaurwaki was no easy task for Kareena Kapoor, then a newcomer. "It was a very complex character. At one point very feminine, at another an aggressive and fearsome fighter who could annihilate any enemy," says Kareena. The series has many interesting anecdotes. Shraddha Nigam (Choodiyan and Krishna Sharma C.A.) had a reasonably good role in the film. She plays Rani, the girl Asoka’s mother wants her son to marry. But the entire role was chopped on the editing table. Viewers will also have a chance of seeing several other scenes that were edited out of the film. But then, you‘ve got to be a real fan to sit back and watch scenes that were not thought fit to be a part of Asoka! Ever since CID hit the viewership jackpot on Sony Entertainment Television, channels have been vying with each other in commissioning suspense thrillers in a bid to emulate the success of the team of super-achieving sleuths. Though Star Plus clocked a winner with Shhh...Koi Hai, Zee TV has been clueless, about the thriller genre and doesn’t even seem to be trying. 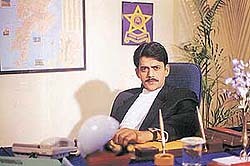 But Doordarshan has suddenly got ambitious and has begun airing Hello Inspector, Tuesdays to Saturdays at 8 p.m. on DD Metro. Produced by Sri Adhikari Brothers, Hello Inspector is a good-in-parts series. There is drama, cliffhanger situations and rousing suspense in some episodes while most others fall flat on the face. The trouble with this high-decibel series is that there are five episodes every week. Given the senseless frequency, even Alfred Hitchcock would find it impossible to keep viewers on the edge of their seats day after day. 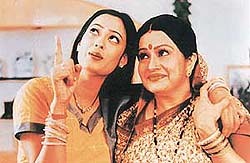 By all accounts, Shweta Tiwari’s place should have been on the stage. Despite being a successful model, her reputation as a theatre person had been growing rapidly after excellent plays like Khoobsoorat Bahu, Kiraayedaar and Gaz Foot Inch. Shweta (left): Ekta Kapoor’s blue-eyed girl? But curiously all those performances at Mumbai’s Prithvi Theatre have been forgotten even as Shweta attains stardom on TV. Though recognition came with serials like Rishtey, Aane Wala Pal, and Daddy Samjha Karo, it was only after she knocked on the gates of Balaji Telefilms that she attained celeb status. So impressed was Ekta Kapoor by Shweta’s performance that she offered her roles in Karam, Kaliren, Kahin Kissi Roz and Kasauti Zindagi Kay. Of course, Shweta brushes aside all talk of her being a blue-eyed girl of Ekta. No, she gushes, Ekta doesn’t play favourites. "She’s a very hard taskmaster and wants perfection. That’s why all her serials are such huge hits." After doing a negative role in Karam, Shweta has now effortlessly switched to playing a simple girl with simple dreams in Kasauti Zindagi Kay. "I am getting many offers but I’d rather concentrate on one serial at a time. And no thanks. She says she doesn’t want to go into films. Unless, of course she gets the ‘right’ offer (y-a-w-n). "If someone offered me a role like Tabu’s in Chandni Bar, I may consider it, " says Shweta. But if such an offer doesn’t come along she’s happy being Ekta’s kamaal ki kudi. Soon enough, it could be earning the sobriquet of the longest running chat show on television. In fact, ever since it began in 1997, it has given Simi Garewal a new lease of professional life that every actress hopes for. Despite its long stint, Rendezvous With Simi Garewal, Star Plus, Saturdays 8 p.m, continues to be an absorbing show, which unlike Jeena Isi Ka Naam Hai on Zee TV sits easy on the eye. There have been sabbaticals, reruns, the show has gone off the air only to return with newer celebrities. Each episode is dedicated to a celebrity accompanied by a person of his or her choice. Guests have included people like Ratan Tata, Sunil Dutt, Kumaramangalam Birla, Hrithik Roshan and parents, Jackie Shroff and wife Ayesha and more. "There is a great freshness," says Simi. "Each show is thoroughly researched and personalities are portrayed as close to life as possible." Indeed it must go to Simi’s credit that she selects celebrities who are of high interest. The bottomline, says the yesteryear actress, is that the people she interviews are all super achievers. "I usually have a lengthy discussion with the people I am interviewing before the final shooting. I hope the effort shows." In parts it does. Though one fervently wishes that she had left behind her affectations in Bollywood. But since the people she’s interviewing are so articulate and confident that such mannerisms are forgotten once the show gets going. In a world of ruthless aggressions and fierce competition, business used to be best conducted by men. Now some of the most powerful jobs around the world are performed by women. What did they do to get there? How are they received by the predominently male establishment? Meet three top female bosses who reveal the determination, inspiration and secrets behind their success in three powerful portraits. Boss Women starting June 8 at 7.40 p.m. every Saturday reveals the secrets and inspiration, power and glory behind these female bosses. The first is Anna Wintour, the editor of America Vogue. The British-born woman is arguably the most powerful figure in American fashion writing. A woman who can make or destroy reputations with a few written words. 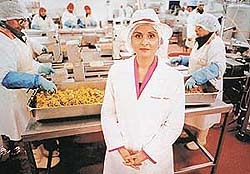 Perween Wars,i also known as The Curry Queen, has built a business with an annual turnover of some 100 million pounds, supplying ready-made curries to supermarket chains. She is Britain’s richest woman of Asian origin, a self-made millionaire. Then there is Pauline Claire, Britain’s first female chief constable. A woman who has not just coped in a man’s world but has actually triumphed by becoming the boss of hundreds of tough-talking cops. What is the secret of these over-achieving women? Is it just the will to succeed of are there other motivating factors as well? Is it sheer luck or is it a labour of sweat and tears? Find out for yourself. The answers are as varied as the women themselves.